Visitors to the Malpensa International Airport will be delighted to know that there are various amenities available within short distance from the Malpensa airport. Their accommodation needs are covered by places like the Sheraton Milan Malpensa Airport Hotel & Conference Centre. Sheraton Milan Malpensa Hotel is located inside the airport's Terminal 1. 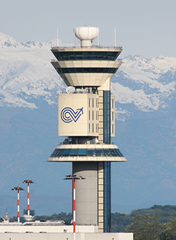 Sheraton Milan Malpensa Hotel is located inside the airport's Terminal 1. It offers air-conditioned rooms with minibar and TV, and spa and fitness facilities. Located just 3 km from Milan Malpensa Airport, the Idea Hotel offers free parking, and a free scheduled shuttle to Terminals 1 and 2. The rooms have Sky TV and air conditioning. Just one kilometre from Milan Malpensa Airport, First Hotel is in Somma Lombardo and provides a free airport shuttle service. A simple breakfast is served from 04:30 in the morning. Sheraton Milan Malpensa Airport Hotel & Conference Centre.